Soak dried shrimps and pound coarsely. Blend onion, serai and kunyit. In a non-stick wok, heat oil and fry the blended onion/cili/leaves till dry. Add the dried shrimp and continue frying. You need to constantly stir it or they will stick to the bottom of the pan. Add tamarind juice** and sugar. Continue stirring until the whole paste is dried. One can keep the portion in individual container and heat them up later. This sambal hairbee taste good if used to make sandwiches, eat with rice or when cooking instant noodle, drop a tablespoon in for added flavour. 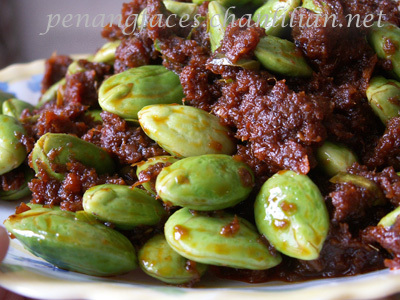 About 200 gms of petai – Add in after adding tamarind juice, to cook.